John Kistner knows you are watching him, and he doesn’t blame you. Kistner, 50, has been watched non-stop for 22 years. And at this point, the standout tennis player from Lansdale, Pa. is simply used to it. As a wheelchair player, it’s something he expects. Kistner can go on for hours about the whispers he’s heard, or the times he’s been stopped by a stranger. He could talk for days about the questions he is asked, or the odd times he’s stopped. That assumption is way, way off. Kistner wakes up every morning for work, which he drives to each day. He works in accounting, 9-5, then drives back to his house in Lansdale, Pa. Some nights he plays tennis. Others, he watches sports on TV. He hangs out with his friends and family, goes grocery shopping, and saves for retirement. Kistner is just like everyone else – except probably better than most with a racquet in his hand. It started four decades ago, when as a 10-year-old, Kistner picked up a racquet and started hitting against the wall. He didn’t play tennis in high school – something he regretted for a while – but stayed active throughout his teens and early 20s. Kistner loved being outside, and coming from a family of athletes, he loved sports. Then, on the afternoon of May 18, 1991, with just one spin of a wheel, everything changed. Out for a bike ride near his apartment, Kistner hit a grate on the road and propelled over his handlebars. He shot through the air and landed awkwardly, shattering his T5-level vertebrae. Kistner spent the next five months in the hospital. Just like that, the 28-year-old had lost all movement in his legs. During that time, Kistner lost 30 pounds, and nearly all of his muscle tone. Time eventually sparked the healing process for Kistner. He had family in the area, and says if it weren’t for his parents, four brothers and two sisters, he wouldn’t have made it through what was the most demanding, difficult time in his life. They drove him around, talked to him whenever he needed it, and provided support. Slowly, Kistner was adapting to life in a chair. He learned that his new life was still a great life – just with a few adjustments. “And wheels,” he said with a laugh. A few years later, Kistner rediscovered tennis. Rehabbing at Magee Rehabilitation Hospital, Kistner heard about a group that played tennis. 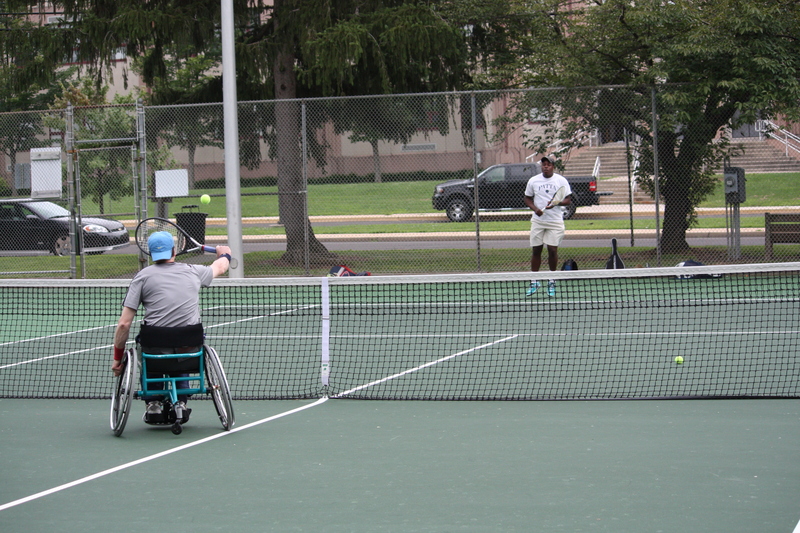 Next thing he knew, Kisnter was on court with other wheelchair tennis players. He started hitting balls, and the feeling he got as a 10-year-old came back to him. Just like that, Kistner found his newest hobby. The hardest adjustment was moving. Tennis – no matter what the format – requires quick lateral movement, and a fraction of a second could mean the difference between hitting a cross-court winner and watching the ball whiz by. Another difficult transition for Kistner came with serving. There are other changes, too. Little things. He discovered early the necessary switch from a two-handed backhand to a slicing backhand, since he’s more restricted in the chair. Kistner developed his game during countless matches, clinics, tournaments and practice sessions. 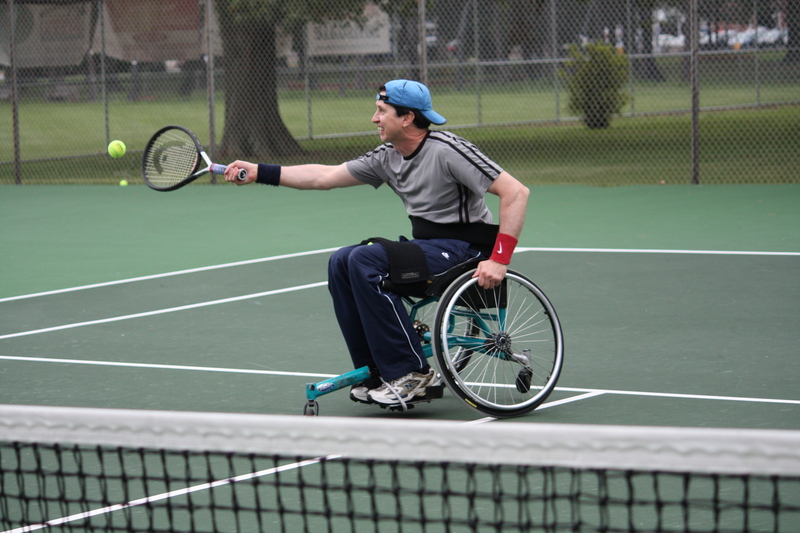 Using a chair made specifically for wheelchair tennis, he’s played in a variety of competitive wheelchair tournaments around the east coast. 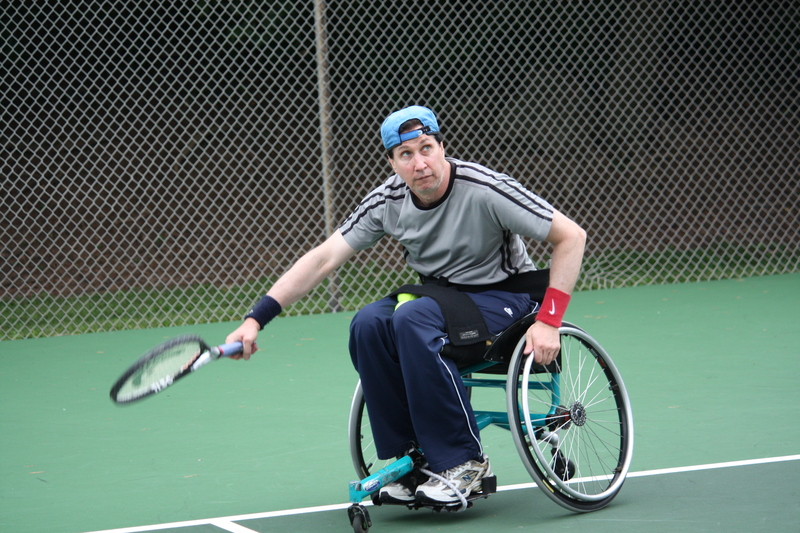 On September 27, he’ll play a Middle States wheelchair tournament at DuPont Country Club. Kistner’s favorite shot – the overhead slam – came naturally, and has evolved into a “game-changer” as he continues to play. In a match, he’s known for mixing things up, and comes to the net when his opponent is vulnerable. Working the court in a figure-eight motion, he glides around the court in such a smooth way that people on the street stop to watch. One thing they notice quickly: Kistner might not run, but he sure is fast. One of Kistner’s best tennis memories came a few years ago, during a wheelchair exhibition at a World TeamTennis match. There, he heard tennis legend Billie Jean King compliment his game. While playing on his local courts – his favorites are just around the corner from his home – Kistner finds himself talking to everyone. People walking by will stop and ask him about life in a chair. Some will stare. Others will pretend not to, but he can usually tell. Some approach Kistner on the street, at the grocery store, or anywhere else they can track him down. Fifteen years after finally picking up a racquet again, Kistner says he’s enjoying tennis and his outlook on life, and is proud of the work he continues to put into it. Sporting his favorite Head racquet and a blue, backwards cap almost at all times, he has a style of his own, and a story that everybody wants to know. Today, Kistner is serving as an inspiration to many. He motivates people to improve themselves, live their lives to the fullest, and enjoy each moment they have. He spends extra time mentoring new patients at Magee Rehab, talking them through difficult times and sharing his life experience. Each step of the way, he uses tennis as his tool of choice.